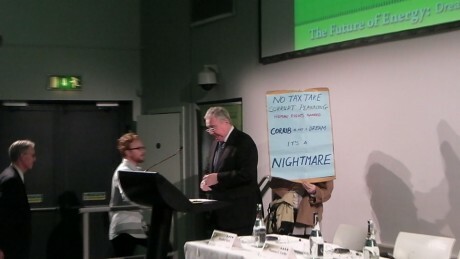 This morning members of Rossport Solidarity Camp disrupted Pat Rabbitte while he spoke at a conference at the Science Gallery in Dublin entitled "The Future of Energy: Dreams and Responsibilities"
Banners reading "Shell's Pet Rabbit" and "Corrib is not a Dream - It's a Nightmare" were held up just as Pat Rabbitte began speaking. After the banners were forcibly removed Pat Rabbitte was challenged on ignoring his responsibilities to the community in Mayo, that are facing a daily Shell occupation. Occupation Local resident Betty Schult at Afri’s event organised in association with Friends of the Earth - 19th August 2012. Local resident Betty Schult spoke on the theme of occupation at Afri’s event organised in association with Friends of the Earth entitled “Ar Scáth a Chéile: Sustaining Hope and Humanity” in Glenamoy Community Centre, County Mayo, on the 19th August 2012. A man was arrested in Dublin on Friday (24th August 2012) following a dispute in a hotel involving Pat Rabbitte, the Labour party minister for communications. Rabbitte was having lunch in Buswells hotel, opposite Leinster House, with Peter Stewart, a former director of the National Asset Management Agency (Nama), when a middle-aged man approached his table. "This man is selling off our oil and gas while Irish people have been evicted," the man shouted at Rabbitte. Nnimmo Bassey, the chair of Friends of the Earth International, visited Ireland recently. In this interview he shares some impressions of his visit. I quite agree with Mr Hegarty's assertion that 'Corrib coverage should come with more balance.' Unfortunately, Mr Hegarty does not believe that it applies to him too. While his article is very flowery in language, it is short of facts. The abnormal load haulage of the tunelling machine was not carried out in compliance with the Permit haulage route restrictions and was in breach of the Traffic Management Plan approved haulage route.